At $30,995, Could This 1992 Mercedes Benz 500E Really Be The Best? Long before Porsche built their first production four-door, they helped with the 500E for Mercedes. Today’s Nice Price or Crack Pipe edition is claimed to be the best of that joint parentage, but will its price have you considering its adoption? Have you seen that TV show about tiny houses? People profess to living in like, 200 square feet of space in these diminutive and oftentimes twee abodes. I don’t think I could store my beloved collection of old car magazines in that small of space, but these folks seem to revel in their minimalist existence. That is I suspect until they get tiny cabin fever. Last Friday we looked at a car that would easily fit into that little house lifestyle. The 2003 Toyota MR2 Spyder that was the object of our interest wasn’t just small, it also came with a seemingly diminutive price tag. That $5,750 asking was seen as a big deal by 77-percent of you who gave the car a Nice Price win, despite there not being anyplace to carry home its hypothetical trophy. When you’re considering small cars, what’s the first thing that comes to mind? That’s right, how you could stuff bigger engines into them. Don’t be shy, we all do it. The idea of the hot rod, or later the muscle car, is nothing new. It is however, something that over the years, pretty much everybody has done. 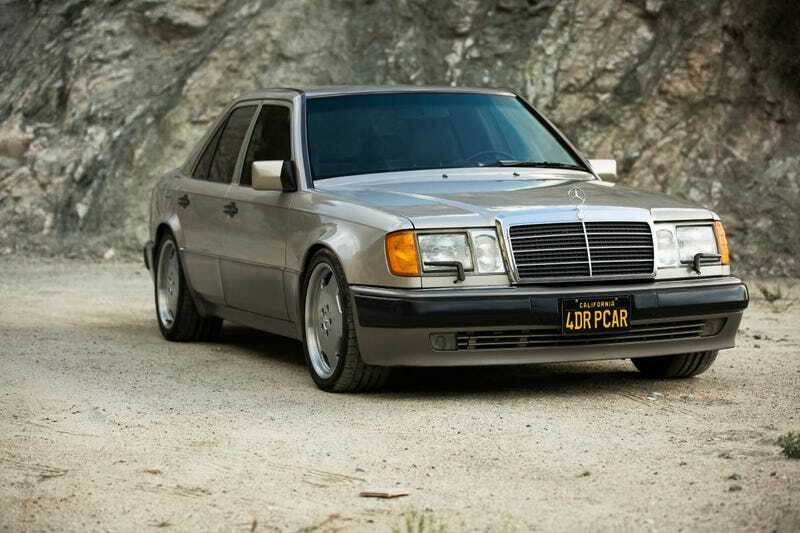 When Daimler wanted to build a hotrod edition of their W124 sedan, they enlisted the help of Porsche. That was because who better to squeeze a 5-litre, 322-horsepower, water-cooled V8 into the nose of a mid-size saloon than a company known for rear-mounted air-cooled flat sixes? It’s interesting to note that Mercedes chose not to go with then partner AMG for the car. You might have thought that tuner would have been the more logical choice seeing as they previously built a W124-based V8 super saloon, the car we all know and love as The Hammer. The resultant Porsche collaboration, the 500E proved a worthy holder of the muscle car title, and was given an even cooler nickname by the German motoring press—der wolf in der kleidung eines schafes—which I think you can translate without any help. This 1992 wolf… er, 500E is claimed by its seller to be ‘The Best,’ and damn if it at the very least doesn’t look as though it’s in the running for that title. Offered up in Rauchsilber over light tan, this 77K bad boy Benz looks just as much like Van Damme in Saville Row suit today as it did when it debuted. The paint holds its shine, and the limited brightwork remains equally bright. The car has been dropped, but not slammed, and rides on AMG Monoblocks. One of the cool aspects of Mercedes’ cars is that you can put modern wheels on an older model and they still look insanely right. If you disagree with that assertion then be comforted to know that the car’s original wheels come along for the ride. The windows carry a heavy tint, and that may be why the interior still looks so fresh. The leather shows a bit of use on the driver’s throne, but it seems serviceable throughout, even on the armrest, a notable point of wear on all Benzes. The dash and spare wood trim is likewise ready to rock. The seller claims to be the third owner, having bought the car from the initial owner’s niece two years back. Originally from Orlando Florida, the car now calls Los Angeles its home, and the seller offers as an enticement to potential buyers a remarkably polished video of the car wending its way through the mountains north-east of the city. That of course indicates that the car runs and comes with working lights. The ad notes that maintenance has been handled exclusively by Mercedes dealers that and along the way that work has included a new transmission, suspension kibbles and bits, and (yikes!) a new wiring harness. Now, I don’t have a clue how you replace the loom on a car like this without taking the whole damn thing apart and putting it back together, but then what do I know? I do know that I expect it’s a hell of a job. Over the course of the seller’s ownership, the car has also seen a new alternator, engine mounts, and ignition consumables. Tires are additional recent replacements. The price tag here is a lofty $30,995, and there’s no word whether that includes the 4DR PCAR (four door Porsche Car) California retro black plate, but it should. That’s a lot of money, however the seller is positioning the car as being the ‘best or nothing’ so you might expect a premium. You might not be expecting $30,995 and so it’s now time for you to vote on this clean title, low mileag, hot rod Benz. What do you think, could this actually be the best and hence worth that kind of asking? Or, for that much would you expect better? H/T to Brent B for the hookup! At $5,750, Could This 2003 Toyota MR2 Spyder Be Your Baby?